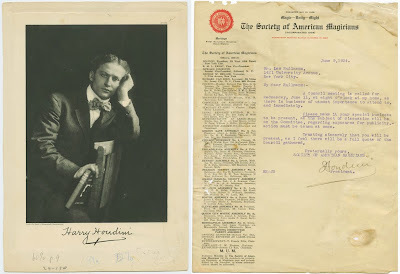 A nice oversized Houdini Challenge poster sold today at Potter & Potter's "Summer Shelf Sale" of magic books and memorabilia for $2,640 (including 20% buyers premium). The auction estimate was $2,000 - $2,500. According to an auction watcher at the Thayer forum, the poster "had at least two aggressive phone bidders." The 1916 14 x 22 poster advertised a challenge to Houdini from U.S. Navy Chief Petty Officers to escape from handcuffs and manacles brought to the New York Hippodrome. As this was during the first World War, this could be considered as a Houdini-World War I item. 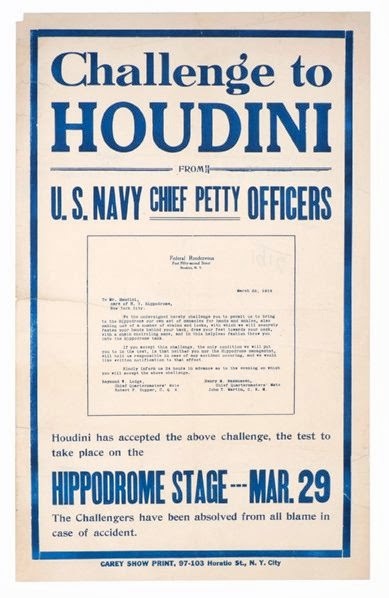 The auction correctly pointed out that most printed matter relating to Houdini's challenges are small handbills, so the size of this adds to its appeal. I also really love the disclaimer at the bottom: "The Challengers have been absolved from all blame in case of accident." 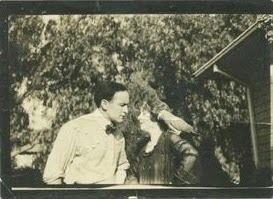 The small candid photo of Harry and Bess Houdini, which I speculated here could be the only photo of them at their Laurel Canyon bungalow in Hollywood, sold for $960. It blew away the auction estimate of $200-250 (and my own humble bid -- sigh). "Papers are full of Houdini taking his secrets to his grave. You know that is not true and it belittles the remaining magicians." That letter sold for $1,140. Among the non-Houdini highlights were an inscribed portrait of Leon Herrmann ($3,360), an Alexander Herrmann Throw-out card ($1,320), and a Harry Kellar "Centipede" poster which brought in the highest price of the auction, $7,800. Congrats to all the buyers.